One of the lead tracks from G8's fantastic debut album "Mine Is Bigger Than Yours" gets the full on single treatment - this time it is the superb "Cathy Omg". G8 is an artist that refuses to be defined by genre and Cathy Omg is a prime example of this. A full on techno groove underpins the coolest of cool vocals with elements of breaks and tech house peppering the tune which is produced to perfection and ideal for those heads down 4 am dancefloors. 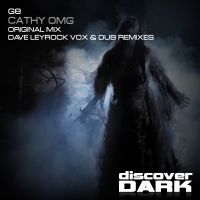 On remix duty we have Dave Leyrock, an experienced producer who is no stranger to the Discover Dark sound and who delivers a tech trance masterclass. His vocal remix hits the spot whilst tearing up the production rulebook. Mixing vocals and tech trance is a tough nut to crack but he delivers a quality remix in the true sense of the word, taking the very best parts of the original and turning out a totally unique interpretation of G8's original. Of course we know that vocals are not for everyone - step forward Dave Leyrock once again to deliver a dub remix that stands in its own right as a quality remix that hits the spot perfectly. 'Cathy Omg.' is available now from Beatport and iTunes.